We sell Salus products like Floradix® - Liquid iron and vitamin formula - 500ml online in the UK and directly from our award-winning store in Scotland. Floradix® contains herbal extracts and fruit juice concentrates. TIP: It is best to take iron on an empty stomach to ensure full absorption - so ideally 30 minutes before food or a couple of hours after. Avoid taking iron supplements with tea, coffee or milk as they can inhibit the absorption. Drinking orange juice or any other fruit juice together with iron supplements can actually help to increase the iron absorption due to the vitamin C content. Where can you buy real Floradix 500ml safely online? 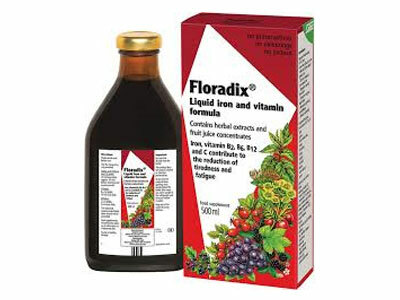 If you are wondering where you can buy Floradix® - Liquid iron and vitamin formula - 500ml safely online in the UK, then shop with us. Floradix 500ml - Floradix® - Liquid iron and vitamin formula - 500ml in Multi-vitamins and Vitamins and Minerals.